Verified on 20 Apr 2019. Ola is Offering First Auto Ride FREE for all Users. Book 3 or more Ola rides and stand a chance to win Beardo vouchers worth Rs 1000. Coupon code valid till 21st April. Looking for the latest Ola Money offers and other exciting deals? Book a cab today and avail big discounts only at GrabOn. You can choose from a handpicked selection of offers. We do the hard work for you. This page is regularly updated with fresh and valid coupons. So, you do not need to go through different sites to find the best offer. What are you waiting for? Book an intercity or Ola outstation ride and travel easy. Latest Ola Wallet And Card Offers- Paytm, Freecharge, VISA And More! Ola is not only about easy accessibility of cabs but also ensures that every part of the experience is smooth for their customers. And thanks to their wallet offers, you can now take a smooth cab ride even without your physical wallet. All you need is a phone! And in this process, you can enjoy exclusive deals depending on what you use to pay you. So, head over to GrabOn’s Ola page and find all the wallet offers and deals under one banner. And in case, you want card offers, Ola has that too! Get up to Rs. 150 cashback the next time you use your VISA card to pay through Ola. Thank us later! Ola India makes booking cabs easy. You don't need to book cabs hours in advance. You can book affordable and comfortable ola cab rides instantly using the app. The app is free for Android and iOS users. Download now and book cabs using ola app offers. You can book a quick ride to the office or go on a long drive with friends with Ola rentals. Ola micro, prime sedan, mini, and share are known for comfort, safety, and pricing. The Ola drivers are reliable and well trained. The cars come in all sizes from hatchbacks to SUV and sedans. If you are in a hurry to catch a flight use the Ola airport drop service and reach on time. Payment is also easy. You can use bank cards, net banking or Ola Money. There is a new option available called Ola Money postpaid. There is a limit of Rs 500 in the postpaid wallet which can be used to book a cab. You can pay the amount at the end of the cycle. You can also pay via Ola Money wallet. You can add money to the wallet using UPI, Debit and Credit card, net banking and PayZapp. Try using Ola cashback offer to save more every time you add money to the wallet. Ola provides a platform for cab booking and rental rides. The booking is very easy. All you need to do is open the app and enter your pickup & destination. Ola will do the rest. Once your booking is confirmed your Ola driver will pick you up and drop you off at your destination. On completing the journey you can pay in cash or Ola Money. Ola offers a lot of benefits. The wait time is short and the service is affordable. You can save more on each ride using Ola coupon code. You can avail other amazing offers like your first ride offer (this offer is valid only for the first time). You can also use Ola recharge code while loading money into your wallet to save more. You can book a ride from Ola Prime, Mini, Micro, and SUV. If you have time you can choose the Ola Share option and pool with others. If you have booked a Prime, you can use the Ola Prime Play and access videos or play songs traveling. You can use the Ola Outstation cabs for a trip with friends or family. It gives you freedom and privacy on long trips. Enjoy comfortable rides at amazing prices using ola outstation coupons while booking the cab. The bookings are available for both one way and round-trip journey. The ola outstation coupon code is valid on trips across Delhi, Gurgaon, Mumbai, Pune, Bangalore, Chennai, Hyderabad, Ahmedabad, and Kolkata. Use the Ola first ride offer and experience the comfort. The Ola free ride is applicable only for first-time users. You can also try the Ola Shuttle available in metros and major cities. Along with multiple benefits that you get, here is a new one: Ola Share Pass! Share Pass ensures a hassle-free ride daily on Ola Share rides. With its fixed rates, you can travel anywhere in the city with fares starting from as low as flat Rs.40 per ride. Your fare will be indicated before you confirm your booking. This pass is automatically applied to your Ola Share rides you take in the city for which you have purchased the pass. How To Get A Free Ride In Ola? Want free Ola rides? Join Ola’s referral programme! All you need to do is invite your friends to sign up on the Ola app with your referral code and get a free ride for every new friend that joins the Ola family and books his/her first cab! You get a free ride coupon, which you can redeem and get your own free ride. Woohoo! Cities such as Jaipur, Surat, Indore, Lucknow, Amritsar, Ludhiana, and Visakhapatnam all have Ola Cabs. The network has increased to cover Coimbatore, Nagpur, Nashik, Vadodara, and Madurai. Ola Cab offers are available in cities like Jodhpur, Kota, Udaipur, and Ajmer. Users in Jalandhar, Patiala, Ambala, and Kurukshetra can book cab rides with Ola. Bookings are also available for Kanpur, Allahabad, Mathura, Meerut, Varanasi, Agra, Haridwar, and Dehradun. The cities of Gwalior, Ranchi, and Raipur now have Ola. You can book an Ola in Hosur, Mysore, Ballari (Bellary), Mangalore, and Hubli. Ola offers rides to Salem, Tirunelveli, Tiruchirappally, Dindigul, Thanjavur, and Pondicherry too. Ola cars can also be booked in Guntur, Vijayawada, Rajahmundry, Warangal, Tirupati, and Amravati. Kochi and Thiruvananthapuram are among the other cities where Ola is available. Rajkot, Jamnagar, Solapur, and Kolhapur are now serviceable by Ola. Transportation in Assam has become easier after Ola came to Guwahati. Durgapur and Siliguri join the Ola network in West Bengal. You can now book a cab in Bhubaneswar, Jamshedpur, Bokaro, Bhilai and, Rourkela. Open the GrabOn website and search for your merchant. For example, if you want to book a cab from Ola, search and open the Ola page. After you are done selecting your favourite Ola coupon code or offer, click on the ‘Show Coupon Code’ or ‘Get Deal’. Some of them also have ‘GrabOn Exclusive Code’ against them. Copy the coupon code and use it on the Ola app Coupon Code area and get amazing discounts! You can also click on the Ola Support option on their app. A young and energetic company based in Mumbai, Ola is one of the most popular cab-services in the country. One of the world’s largest cab-sharing service, Ola cabs has revolutionized the way you reach your destination. Nothing excites them more than using the cutting-edge technology to bring the same efficiency and customer experience to the car rental industry, which people expect from flights! Now go on a weekend getaway without wasting time on a good car rental. Book a cab, anytime and anywhere. Ola cab booking just got easier with their new updated ola app. You can book cabs for the day with Ola Rental or even go outstation with Ola Outstation. Cheap, affordable and fast, Ola cabs is the alternative to stuffy transportations. Experience high-quality cab services with Ola across 110+ cities with 10,00,000 professional driver-partners. Ola Cabs is available in Mumbai, Delhi, Bangalore, Pune, Chennai, Goa, Jaipur, Hyderabad, Chandigarh, Ahmedabad, Surat, Indore, Lucknow, Amritsar, Ludhiana, Visakhapatnam, Coimbatore, Nagpur, Nashik, Vadodara, Kolkata, Aurangabad, Madurai, Tiruchirappalli, Rajkot, Jalandhar, Mysore, Udaipur. You will never run into trouble using Ola, thanks to their highly dedicated ola customer care. Ola has also recently introduced Ola credits, which is aimed to make your riding experience easier. Now travel hassle-free and relax comfortably! Redefining customer satisfaction, Ola has changed the way people perceive about booking cabs. So, go ahead and book an Ola today. 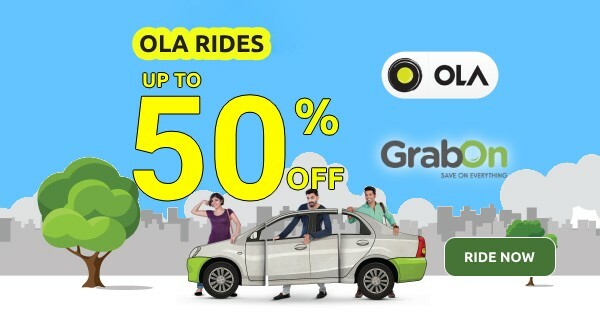 Make use of their services at relatively low prices by availing Ola coupons from GrabOn and make sure your weekend trip is far more interesting. Not to mention budget-friendly!